This past weekend I was fortunate enough to be invited to present at the GAFE Summit featuring Google and Future Ready Schools just outside of Montreal. I was stoked to present on MakerSpaces, Chrome Apps & Extensions, and Google Add Ons and share with other educators and leaders how we use these tools in York to enhance learning. I also always enjoy the conversations and connections with others that attend my sessions, but also in the sessions that I attend and at breakfast and lunch as well. Hearing about what other schools and professionals are doing could be one of the best forms of professional development that I can think of, and this conference drove that point home on numerous occasions. It started off with an inspiring keynote by Leyden High School's Principal, Jason Markey (@JasonMMarkey), in which he talked about the importance of human connections within education. Jason even brought a teacher and student from his district, just outside of Chicago, to share a truly inspiring story of adversity to overcome obstacles, as well as a teacher's willingness to provide a greater opportunity for her students. I have seen Jason speak before, as we first met in Burlington, MA at a previous GAFE Summit, but this was the first time that I was able to work with him on the presentation team as well. ​Jason is doing some amazing things in his school, and commented many times during the conference that the real power in all of this is sharing it with others. Schools shouldn't be competing with one another, but rather make connections and share successes with one another so that we can all grow as a system. I couldn't agree more! I look forward to connecting with Jason and his colleagues in the future and hearing about some of the other great examples they have tried at Leyden High School. At lunch I connected with some private school teachers in the Montreal area that were struggling with trying to persuade their administration and tech department to jump to Google Apps for Education (GAFE). They see a lot of special needs students within their school and were consistently blown away with some of the free assistive technologies that are available, widely used and shared by other districts that have adopted GAFE already. It was also nice to chat with Kim Meldrum (@MeldrumKim) again who really was a huge part of organizing the event and was also responsible for obtaining a license to share Tony Wagner's film, Most Likely to Succeed, a documentary about San Diego's High Tech High and some of the innovative programs, philosophies and thought provoking ideas they have established within their school. It was certainly inspiring and managed to consume most of our discussion over French delicacies that evening at dinner. I suggest you check out the video and ask to host a screening within your school or district. Day two kicked off with another "ah ha moment" as I watched Kern Kelley's (@kernkelley) keynote on Trust in Technology. I seem to have a lot of these moments at GAFE Summits where I am shaking my head in agreement and understanding of the speaker, or attendee, talking about problems that they face within their schools. It is nice to know that we are not alone in some regards, but this point also re-illustrates why we need to do a better job as a whole of sharing our successes with other school districts and work together as one. Kern being from Maine, and somebody I look up to as a Tech Director, was someone I had also connected with before at a few GAFE Summits in the past and our state ACTEM Tech Conference. His ideas, programs and relationships with teachers and students are truly models to look into. A student run help desk group, The Tech Sherpas, that Kern developed and oversees also attended the conference. They assisted in presentations, developed some fun MakerSpace stations, and provided tech support to attendees as well. Seeing the students in action during the conference and hearing about their experiences in the student conference the day before was truly powerful. A new connection that I made this weekend was with Jessica Loucks (@JLenore24), a Tech Integration Specialist from Manchester, CT. She helped to implement MakerSpaces within her district three years ago as an early adopter and was clearly passionate about what this type of mindset and space could spark in education. Going through this process ourselves, I was eager to introduce myself and chat about follow up conversations as we roll this philosophy out within our district as well. ​After presenting on the ideology of the maker mindset in schools and redesigning spaces myself, I jumped into Jessica's presentation on MakerSpaces where she continued the conversation and allowed attendees to play with different types of tech toys and maker kits that she uses within these spaces in her district. It was a great place to collaborate and think creatively with other professionals in the room about what types of ideas they could bring back to their schools, or share ideas that have worked for them before with the rest of the group. As always, I leave a GAFE Summit full of energy, inspiration and a bit overwhelmed to boot! It's a lot to soak in within a weekend. One colleague stated when I was ready to attend my first GAFE Summit three years ago, "Be prepared to drink from the fire hose!" He couldn't be more correct in that statement. There is so much great information to take in, process and then bring back to our own learning spaces that it can feel like a downpour of knowledge. The reality is though, if I only take back three important things, it would still be of value to our system. ​I still believe educators should be able to take a day, or a half day even, within their system after a valuable conference to digest everything that they have learned and plan out how to implement some of these new ideas, programs or strategies with colleagues before jumping right back into their daily routine. In fact, my colleagues that attended the conference with me, Annette Slone (@slonean), an elementary Technology Teacher/Coach, and Amy Roberson (@amyroberson) a high school Library Media Specialist, have planned to hit just a few people at a time with some new ideas and dig deeper with these new strategies to build relationships with the teachers before publicizing any of it to the whole staff to see if we can motivate more to do the same. I for one cannot wait to present and attend my next GAFE Summit, which will be my 9th in Yarmouth, Maine this summer. As well as bring another group from York along for the ride so that they can soak in the wealth of knowledge that the EdTechTeam (@edtechteam) and its presenters provide everyone with at their global summits. Again a great job done by all. I look forward to the future connections and conversations! A list of 50 easy to use steps to using Twitter in education. The state government has joined with the Australian Centre for the Moving Image on a three-year project to develop students' science, technology, engineering, art and maths skills via the creation of computer-based games. 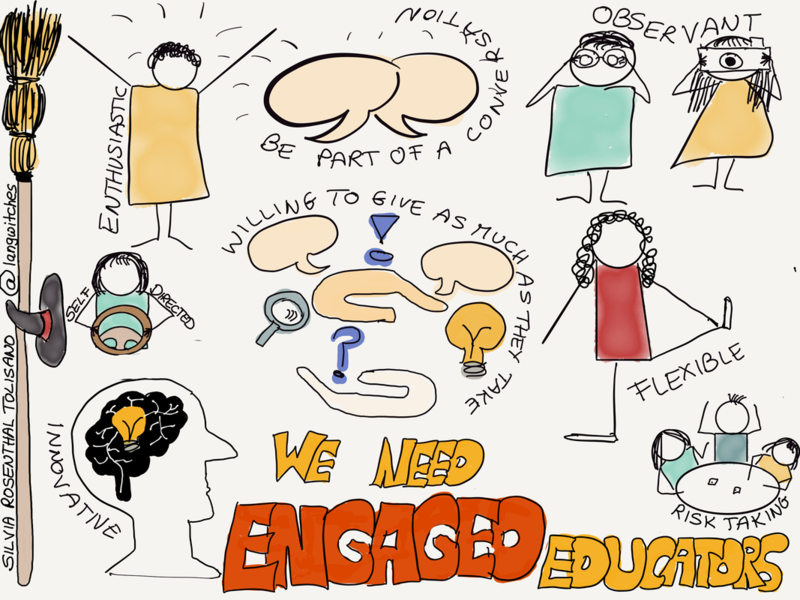 ​With all of the discussion around the role of online education for traditional colleges and universities, over the past month we have seen reminders that key concerns are about people and pedagogy, not technology. And we can thank two elite universities that don’t have large online populations — MIT and George Washington University — for this clarity. ​Professional development for information and communications technology (ICT) can be challenging for many reasons, not the least of which are rapidly changing technologies and the varying levels of ICT competencies within a school. A slide deck shared by Leyden High School's Principal Jason Markey to inspire and provoke good conversations and relationships between staff and administration. ​The idea that the U.S. may be facing a potential teacher shortage, or that teachers are consistently undervalued, probably wouldn’t surprise anyone who follows today’s education news. And, as Teacher Appreciation Week begins on Monday, it’s worth remembering that the problem isn’t exactly new. 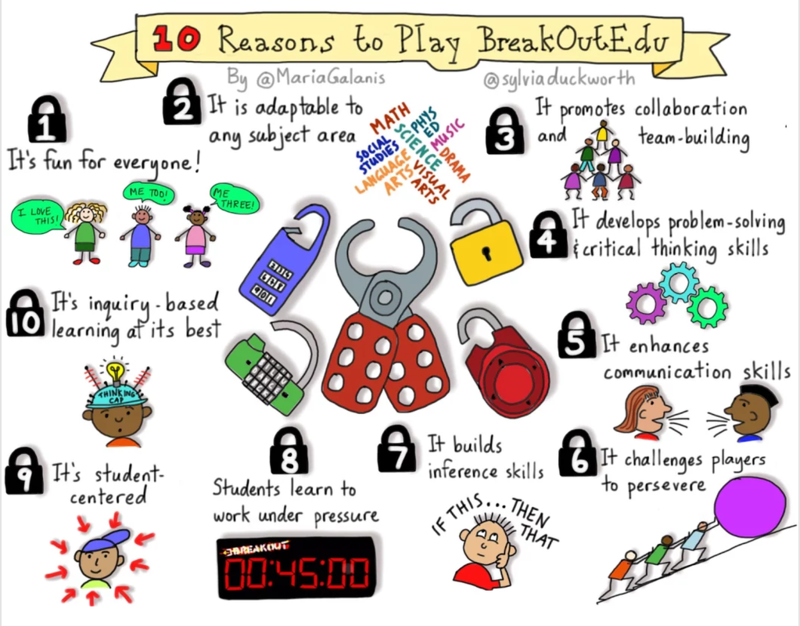 That's right we now have a Breakout Edu kit in each of our libraries across the district. Are you interested in trying it out yourself or with your students. Ask your friendly librarians to checkout the kit and gain access to the mysteries online. We will also showcase during GAFE Peak sessions this summer. Every day, professionals in STEM careers help people get better, discover new things, save the planet, build the future, solve mysteries, and play with some very cool tools. iON Future lets you explore these careers, find the ones that best match your interests and then play your way to your dream STEM future. Welcome to The Magical Library, where anything can happen! Meet Henry, a wonderful wizard who lives in the magical library. He wants to teach you about the incredible people that create all of the amazing books in the library. A STE[A]M-based GLOBAL education program, Cubes in Space™ provides students a no-cost opportunity to design and compete to launch an experiment into space!Utilizing formal or informal learning environments, students and educators will be exposed to engaging content and activities in preparation for the design and development of an experimental payload to be integrated into a small cube (Cube). These Cubes will be launched into space via sounding rocket from NASA Wallops Flight Facility on Wallops Island, VA in late June 2016 and is open to U.S. and international students ages 11-18. TodaysMeet is the premier backchannel chat platform for classroom teachers and learners. Designed for teachers, TodaysMeet takes great care to respect the needs and privacy of students while giving educators the tools for success. ​A Creative Space is a space in which people make things: students, educators, parents & community members. It is informed and inspired by the Maker movement, by Art Hives and by the act of creation that makes us human. ​Story Spheres is a way to add stories to panoramic photographs. It’s a simple concept that combines the storytelling tools of words and pictures with a little digital magic. First upload a Photosphere, a 360-degree photo you can take on your phone using Google’s Photo App or similar program. ​For more than 30 years, Discovery has told stories like no one else — transporting you to places you didn’t know existed and sparking curiosity at every turn. Now we enter a new chapter. Virtual Reality can take you to new worlds like never before, immersing you in time, space and story. Here’s a first look at our latest productions in this exhilarating new space — from shark-infested shipwrecks to freeboarding the windiest street in the world — with much more to come. Welcome to Discovery VR. Thanks for visiting my Virtual Reality in Education resource page! Here, I'll include all the great educational content I find for Google Cardboard, VR, and 360° content. All kinds of shapes and sizes - so you can get the right computer for you. Use this site to compare and contrast different kinds of chromebooks so you can make the best decision for your needs. ​National Teacher Appreciation Day is celebrated on Tuesday of the First Full Week in May (for 2016 it is May 3rd). In honor of the day and all the awesome things educators do, this blog post highlights ten Google-related tools to makes the lives of teachers better. Your account is kept secure in different ways. Find out what new features Google has embedded into their suite of apps this month. What are your goals for 2016? There are so many new and exciting things to try both in and out of the classroom. So I put together a list of 16 Things for Teachers to Try in 2016 to help inspire educators to try something new this year. What will you try? What would you add to this list? Please add to the comments below. ​Recently Google has quietly rolled out a new tool that lets you save and organize images and websites to one central collection. How quietly? Well, as far as I can tell the tool doesn’t even have an official name yet, and there have not been many posts or announcements from Google about it. So for now I am just calling it Google Save. As I’ve written many times over the years, Screencast-o-Matic is my favorite tool for creating screencast videos on Mac and Windows computers. Unfortunately, it doesn’t work on Chromebooks. In the past my go-to recommendation for screencasting on Chromebooks was SnagIt for Chrome. That’s still a good option, but this week I found a Chromebook-compatible screencast tool that I like just a little bit better. The method is very simple and easy and you need to follow some simple guide that we are going to discuss right here. So follow up the steps below to proceed. Technology has always helped me to stay connected with my kids no matter where they are. We have taken advantage of texting, phone calls, Google Hangout video chats, Facebook, and more. However, a mobile app based on Google Maps has recently been released that goes one step further to increase the safety, communication, and connection for our students as they move off on their own. "Night Walk" takes you on an immersive journey through lively Cours Julien, a neighbourhood of Marseille famous for its unique atmosphere and street art. Listening to your guides Julie and Christophe, you can wander around the vibrant streets as if you were really there, thanks to 360-degree panoramas that we captured at night. Your walk is enriched with photos, images, videos, sounds and interesting facts, allowing you to dive into this neighbourhood and learn more about its diverse culture and history. Enjoy your night walk! Inside Abbey Road is a collaboration between Google and Abbey Road Studios, and is not endorsed by the artists featured. Connect with us on social media, become a Maps maven, catch up on the latest news, and more. Come and play around with Google's latest experiments with maps. ​Back when I was in high school (let’s not mention how long ago) I took four years of French. I felt I was reasonably proficient in the language, being able to read, write, and speak in French. Of course you would think I should be after four years. Google Classroom: Schedule That Assignment – New Feature! If there was any doubt as to if the Google Classroom team listens to teacher requests, today’s new feature update proves that they do! Teachers have been clamoring for, and now can, scheduling Google Classroom assignments. Learning Management Systems allow teachers to manage and deliver online content. Often they are used to provide an online platform for full online courses, blended courses, or simply to provide access to resources for classes. They are mostly ‘self-contained’, providing tools within the platform. This is your complete guide to all of the Google Certifications for Educators: Google Certified Educator, Level 1 & 2, Google Certified Trainer, Google Certified Administrator, and Google Certified Innovator. This guide will help answer all of your questions and clarify the differences between all of the certification options. So you are thinking about taking the exams to become a Google Certified Educator? But you are wondering what topics and skills are covered by the tests. This blog post is here to help you!